A wildfire rages in Eagle County, Colorado, on July 6. Let’s begin with a Colorado update. From the Wyoming border to southern Colorado, there are dozens of active wildfires burning. The Spring Creek fire, a 107,307-acre fire, is now 70 percent contained. The fire, which began on June 27, is burning in Costilla and Huerfano counties and has consumed more than 132 homes. The second largest active Colorado fire is the 416 Fire, which is burning 13 miles north of Durango. This fire required more than 1,000 firefighters to achieve 100 percent containment of this 54,122-acre fire. However, the weather in Colorado lately has allowed for more success in containment efforts; meanwhile, California’s current heatwave makes firefighting conditions very difficult. According to the California Department of Forestry and Fire Protection, 2017 was the most destructive year for wildfires. More than 9,000 fires burned 1,381,405 acres. This year has also seen a lot of fire damage. Right now, California is experiencing serious wildfire conditions. Napa and Yolo counties are fighting the County Fire that has now grown to the size of Atlanta, and is only 48 percent contained. On July 9, Santa Barbara County evacuated thousands of people from the threat of the Holiday Fire. This fire started July 6 near Goleta, California, destroying 20 homes and structures. Thousands of others are left without power in an area now under a state of emergency. The combination of heat, wind and low humidity has cultivated an intense fire-prone climate. 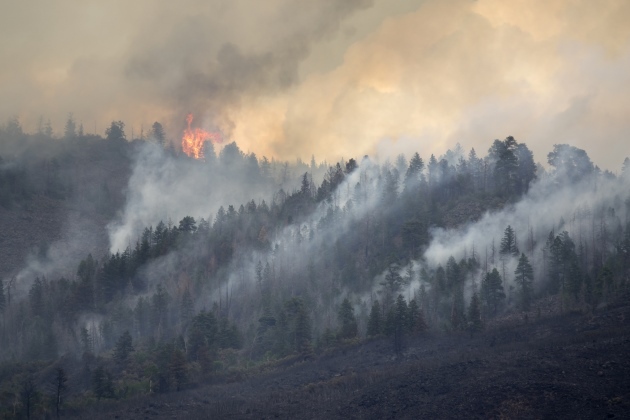 Given the intensity of wildfire activity over the past several years, even the mainstream media has been forced to acknowledge the link between climate change and wildfire growth. According to the Union of Concerned Scientists, from 1980 to 2012, the average number of large wildfires has grown from 140 to 250. Since the early 1970s, the average length of wildfire season has increased from 5 months to 7+ months. Generally, over the past 12 years, every Western U.S. state has seen an increase in the average number of large wildfires per year, and this year is no exception. This increase is linked to the fact that since 1970, Western U.S. states’ annual average temperatures have increased by 1.9 degrees F. This is approximately double the pace of the average global temperature increase. We will continue to watch closely as teams of courageous, and sometimes very overheated firefighters do their best to contain the fires. Currently, it is unclear how much longer this round of Western state wildfires will burn. One thing is certain here: Western residents know how to bounce back after fires and other natural disasters. It is no doubt sooner than later that people will return to impacted communities, searching for some semblance of normal, if there is such a thing.